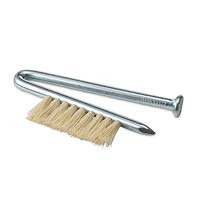 I saw this adorable and rather literal nail brush at uncommongoods.com. I find things like this charming. I also seem to take great joy in dropping my manicure tools on the bathroom floor. The construction seems to fit the sturdiness I require. Reading about the creative process, I was amazed to discover these nail brushes are hand made with contributions from 15 blind craft persons employed for the task. The Berlin studio utilizes techniques developed by the Institute for the Blind. I wanted to share this find with you and its inspiring story. I haven't purchased this nail brush yet, but I am very tempted! This is so cute, I love stuff like this - I'm tempted too! Wow, that nail brush sure has an intersting background! Lucy: I love cheeky items with a purpose! kittypolishnbags: I was interested even before I read the story of origin and even more so afterwards!